With over ten years of experience, TPod Design offers design services and brand-focused online marketing support for small businesses. We assist companies and individuals with user-friendly websites that lead to sales, branding, logo design, custom calendar and agenda design, branded promotional items, digital publishing, and so much more. You can set up your social media accounts, brand your profiles, receive a market analysis, devise a strategy, schedule your posts, and integrate 3rd party applications to turn conversations into sales without ever lifting a finger. Our social media and email marketing efforts can work together to engage your community, build your list, and generate sales while you sleep. Let us turn your to-do list into a to-DONE list! Rapid is a quick-turn manufacturer of sheet metal and CNC machined parts. The company provides quotes within 24 hours, and produces prototypes and low-volume production parts within days. Recently Rapid was purchased by Protolabs, making Protolabs the world’s fastest digital manufacturing source for rapid prototype and on-demand production parts. Combined, Protolabs now offers over 700,000 square feet of manufacturing space spread between 5 locations in the United States and another 9 manufacturing facilities worldwide. Visit our website to learn more about our exciting career opportunities. Crown Uniform & Linen Service is an industry leader, specializing in proving the image of today’s businesses, offering custom apparel programs to meet the needs of commercial, industrial, medical and food service markets. We are committed to building long lasting customer relationships by providing efficient and cost-effective textile solutions with a personal touch. A career at Crown is not just another job. We know that our success is a direct result of strong teamwork and we are dedicated to building long term relationships with our employees. If you would like to be a part of a winning team that values your contributions, check out our complete list of open positions and apply today! Millyard Technology Park in downtown Nashua is a great place to rent commercial office space! We operate with a gross lease so everything is included in your rent, besides any phone/internet costs. Rental rates run anywhere from $20-$30/sf. We currently have space available from 100-14,000sf. We also have secure storage units available at $10/sf. We have a community conference room that tenants can schedule for 2 hours/month for free. It is then $20/hour for every hour after that. Non-tenants can schedule the conference room for $50/hour. The business office hosts on-site maintenance and on-site property management. The property includes free parking, a cafeteria that serves hot entrees weekdays from 7am-2pm, and a public boat launch with access to the Nashua River. The Tulley Automotive Group first started at 280 main street in August of 1957 with the Buick franchise. 61 years later the Tulley family are all still very busy with Buick, GMC, Mazda and BMW in Nashua as well as their BMW Satellite at 170 Auto Center road in Manchester N.H.
We are a full service and Body Shop dealership located at 147 Daniel Webster highway in Nashua. We are very pleased to support the Kyle Bedinger Wiffle Ball Tournament and to help promote his legacy through sports in Nashua and we wish the Bedinger family much success with the tournament. 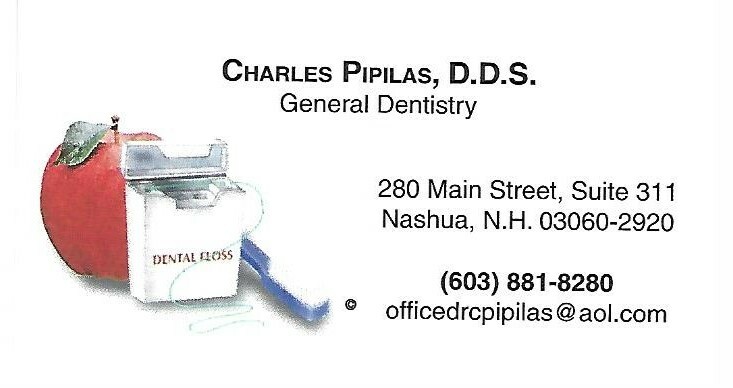 Maplewood Dental Group is a family practice serving the greater Nashua area since 2008. Doctors Marium Qureshi and Paul Pederzani, along with their wonderful staff, offer a wide range of services focusing on creating and maintaining health in a caring, welcoming environment. Since 1856, we have remained committed to providing our customers with superior banking services and helping to make the communities we serve a better place to live and work. NBT Bank employees contribute time and expertise to many local committees and boards. Community Involvement is a core value for NBT Bank and our staff. Employees are encouraged and empowered to volunteer and be a resource to their community. If something is important to the community, you’ll likely find the people of NBT Bank involved in and supporting the effort through time, money or resources. NBT Bank operates through a network of more than 150 banking locations with offices in New York, Pennsylvania, Vermont, Massachusetts, New Hampshire and Maine. We know our customers, communities and the people in Manchester, Nashua, Keene and Portsmouth and are proud to be a partner helping them reach their goals while growing and supporting the community.